Impress the office or send your family the gift they all can enjoy when you send our beautiful handcrafted 25. LB burlap gift bag! Each bag is filled with our classic lightly salted pistachios. 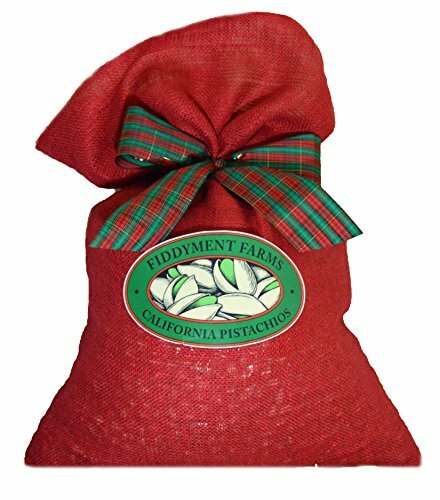 Fiddyment Farms has been in the business of growing pistachios since 1968 and is committed to providing the highest quality and freshest California pistachios on the market today. We roast and package in small batches to ensure freshness and adhere to strict quality standards. The perfect healthy gourmet gift for any occasion. Roasted Pistachios processed in small batches to ensure freshness and top quality. Beautifully hand made burlap bag accented with a festive holiday bow. Naturally opened California grown jumbo sized pistachios. The premier gourmet pistachio company since 1968. If you have any questions about this product by Fiddyment Farms Gourmet Pistachios, contact us by completing and submitting the form below. If you are looking for a specif part number, please include it with your message.